Can The Russian Economy Withstand War With Ukraine? On Monday, following the weekend arrival of Russian naval ships to the Crimean port city of Sevastopol, the Moscow stock market fell 10.8%, devaluing Russian companies by nearly $60bn. Russian oil-giants Gazprom saw their shares plummet, and the ruble, already down 10% this year, fell below 50 to the euro for the first time. To counter the fall of the ruble, Russia’s central bank sold up to $10bn of its gold and foreign exchange reserves, and announced a rise in interest rates from 5.5% to 7%. This is nothing new in the economics of unrest. Markets, naturally, do not react well to uncertain geopolitical situations (and visa versa), especially considering the reliance of Europe on Russian energy and Russia’s reliance on European trade partners. Any instance of a breakdown in relationship, as shown on Monday, can force either side of the conflict to re-think their strategy. So delicate and intertwined is the global economy that commentators have suggested the markets can do more to effect Russian advances than diplomats ever could. But markets are volatile. A blog written today on the current Russian economic situation may be outdated within a week. The markets, in Europe as well as Russia, have since improved and somewhat stabilized. Still, the best course of action for commentators is to make sense of the numbers in order to better predict events otherwise reliant on the whim of the Kremlin. As of February 2014, Russian inflation stood at around 6%. The graph below shows the decrease in inflation from the start of the economic crisis (that coincided with Russia’s war with Georgia). A continued fall in the ruble can lead to a dramatic rise in inflation. Raising interest rates and spending quadruple the amount of foreign exchange they are authorized to spend, Russia can bring the ruble under control. However, the below graph shows that Russia (as compared to 2008) has less foreign exchange reserves to spend. 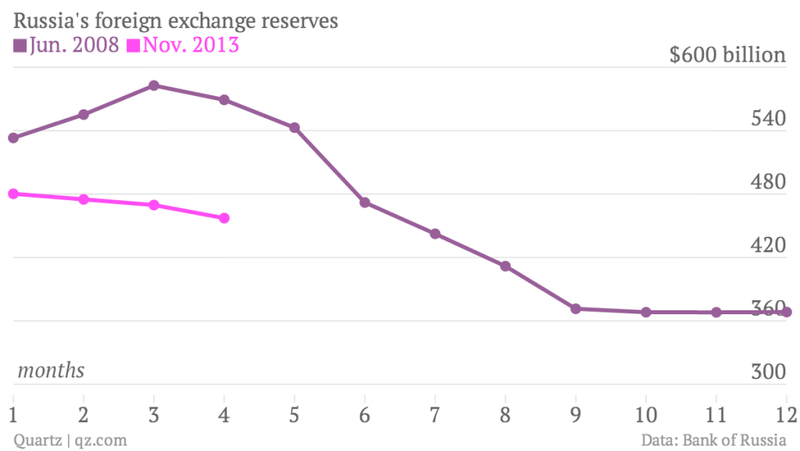 If reserves fall as much as they did in 2008, it would account for 40% of current Russian reserves. To put this in the context of how Russian citizens may be affected, if the ruble continues to fall, inflation will rise, leading to a rise in the cost to standard of living. The higher the costs, the less demand, the less demand, and Russia will experience a rise in unemployment. Again, compared to 2008 Russian unemployment has decreased. However, another neighborhood conflict, like that with Georgia, and many fear previous economic hardships could return. When economic hardships were last this prevalent, Russian citizens staged various protests. Will Russians continue to support an effort in Crimea if they witness a drop in their standard of living? Will the Russian economy incur the same rate of downfall experienced in 2008? Such rhetoric is alarmist for now and entirely depends on the scale of the current conflict. Coupled with a decrease in reliance on Russian gas reserves via Ukraine, and a weariness for investors and Russians alike to keep money in the country, some commentators see the situation as being solely a heavy handed tactic to ensure Kiev considers Russian interests. Although the Russian economy is in a better shape than in 2008, going to war against an army more capable than Georgia in 2008 could have detrimental effects. Whether economic factors will inevitably decide the Kremlin’s actions in Crimea remains to be seen. Gaging from his most recent press-conference, Putin himself seemed wavered by the entire conflict. If this was a reaction to Monday’s news or not is unknown. What is certain though is that however the events unfold in the coming days and weeks, however resilient the Russian economy may seem to be, Russia is not in a position to ignore the logic of the market. “…however resilient the Russian economy may seem to be, Russia is not in a position to ignore the logic of the market.” – fully agree. Russia may get a tactical advantage from annexation of Crimea, but in the long-term the losses will outweigh the gains. This entry was posted on 05/03/2014 by ISIS Europe in Akash Radia, Contributors, Opinions and tagged crimea, economics, eu-russia, foreign exchange, gas, Georgia, gold reserves, inflation, interest rates, micex, ruble, Russia, russia-ukraine, ukraine, unemployment.